I have been hoarding this gorgeous silk crepe de chine for about a year now waiting for the perfect project. I didn’t have a lot, and I knew I would need extra for patternmatching, so I finally decided that a tank top would be perfect. Instead of buying a new pattern I decided to give the Southport Dress a little hack and took pictures along the way in case any of you wanted to give it a try too. It’s a really simple hack with just a few steps. 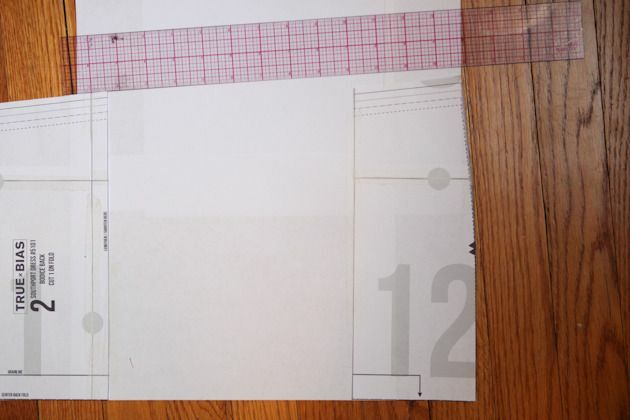 Step 1 – Take your pattern piece and cut it along the lengthen / shorten line. 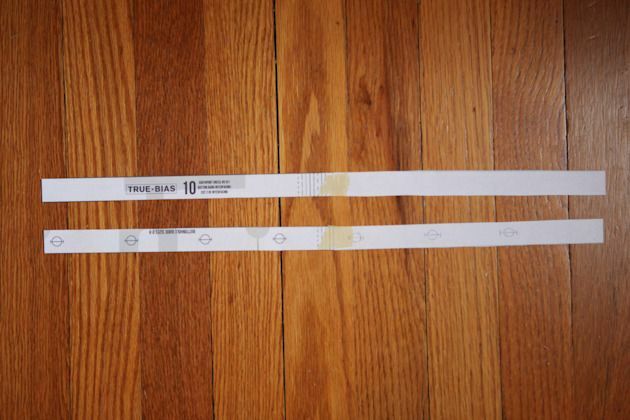 Put some paper behind it and separate the top and bottom by the desired amount. For me it was 8 1/2″. I am a little short so you might want to add a bit more if you are tall or long waisted. Just compare it to some ready to wear tops you have and see what you like. 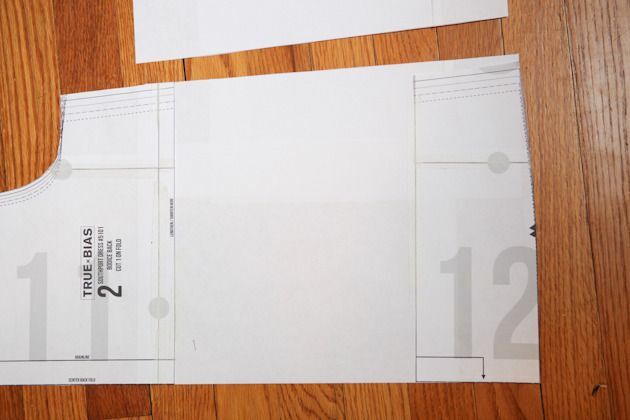 Tape the pattern pieces to the additional paper so that it is separated by that desired amount. 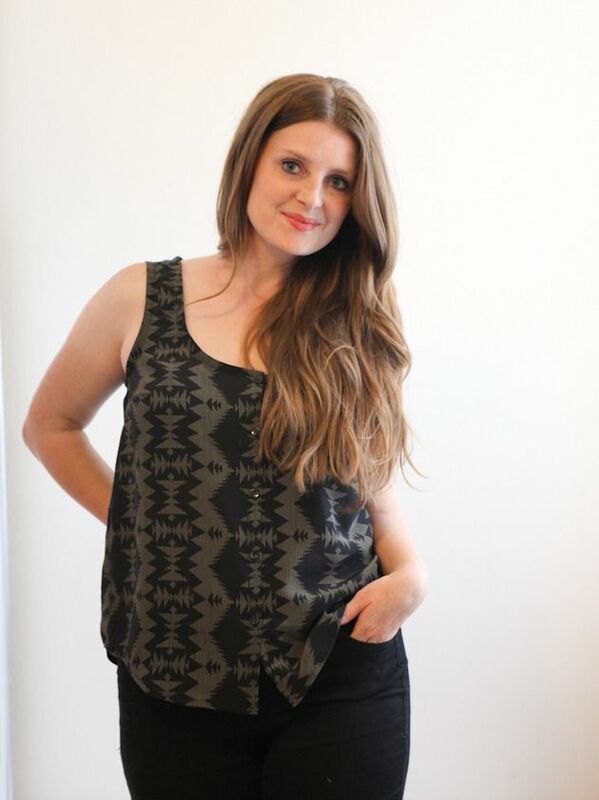 Step 2 – The width of the top should already be wide enough to fit over your hips, but since you will probably be wearing this top over jeans or other pants, I think that it’s a good idea to add a bit more width at the bottom. 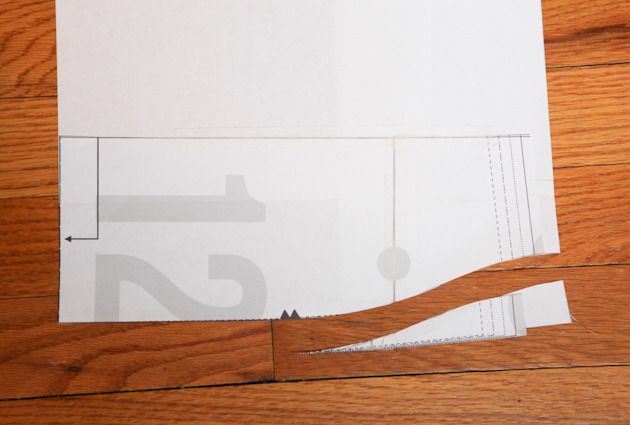 Make a small mark 1/4″ out from the original side seam. This will be added to the front as well making a total of 1″ of extra ease at the hips once sewn. Connect this small mark with the top section creating a nice fluid line. 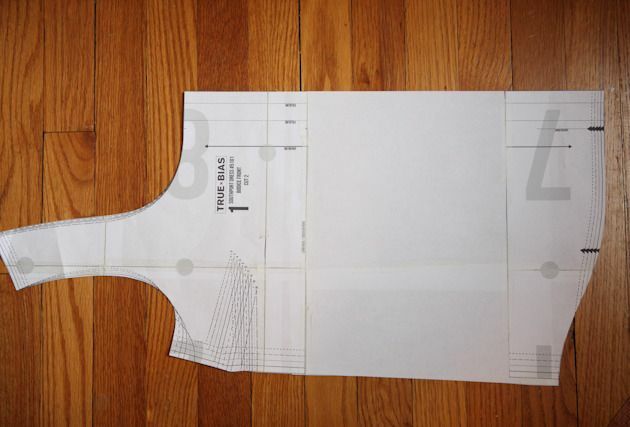 Step 3 – Cut along this new line to create your new side seam. Step 4 – This is optional, but I like my hem to be a bit shorter at the sides than at the front. To do this, mark about 1″ up from the current bottom on the side seam and make a nice curved line to connect to the original bottom a few inches out. Harder to explain than do, so just make it look like the picture below. Cut the new hemline. That’s all for the back! Step 5 – Do the same exact steps to the front so that it looks like this. 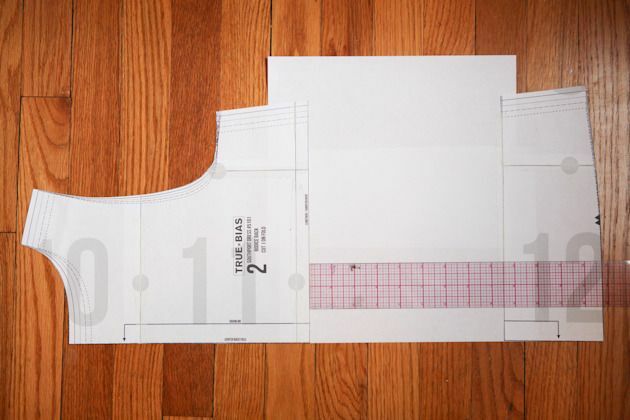 Step 6 – Also lengthen the interfacing and the button / buttonhole guide. Mark a few more buttons and buttonholes the same distance apart as the first ones. 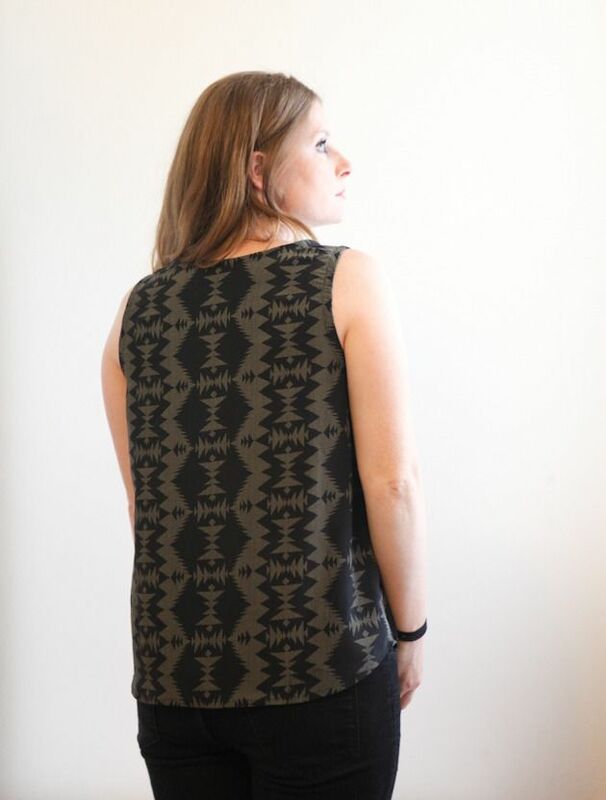 Step 7 – You are going to sew up your tank in the exact same way as the pattern instructs, except that you should hem the tank top by turning up 1/4″ and then another 1/4″ and then topstitching at a scant 1/4″. Give it a good press and you are done! I am pretty pleased with how this turned out. I want to make a chambray one next. This looks fantastic Kelli! Thanks for sharing all the details – I can’t wait to try it out! Looks so cute on you! Excellent fabric choice! This is a great idea. I keep trying to get the grainline tiny pocket tank to fit me correctly and I was just thinking about getting it back out, but there is no sense in reinventing the wheel when the southport fit me so well right off the bat! I have some small yardage that I need to use up, so this will be perfect. Thank you so much for this tutorial, Kelli! If I am between sizes 2 and 4 (33.5) in the bust, would it be a good idea to size down, since there is 3 inches of ease in the pattern (finished size is 36 inches for size 2)? My hips are 36.5 inches, which puts me in size 4. Thank you! love this! great fabric too – is it Pendleton? it is! found it in a store in the garment district. wish i had bought more. I love your tank! Perfect timing Kelli, especially as I’m doing some pre-vacation sewing for the next few days! 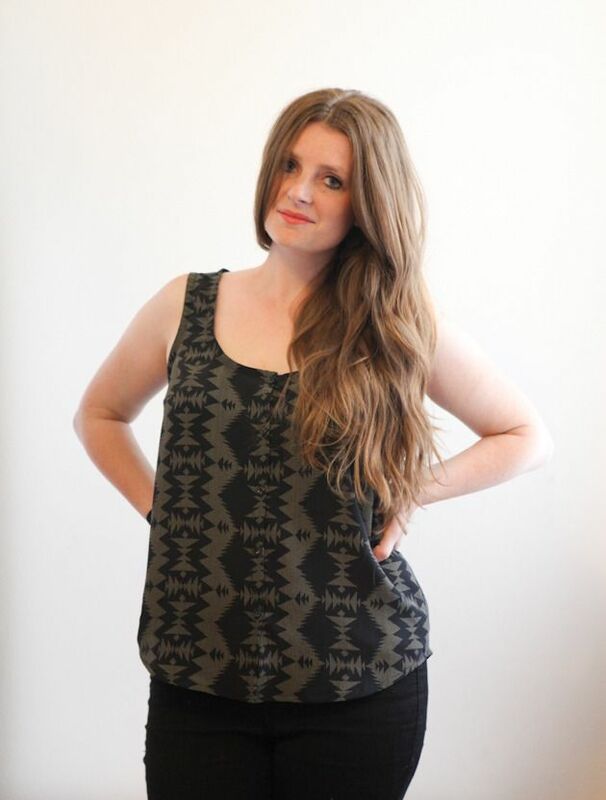 Today I’m cutting out my 3rd Southport Dress and will now be adding a Southport Tank to today’s to-do-queue. The tank seems like a great stashbuster too, which is always a plus. The hubby just left for a 3 day golf trip so it’s Sew City here at home :D! What a perfect tank! Nice hack Kelli. And that fabric is gorgeous…. I will try this for sure! Can’t wait for a jumpsuit hack!!!!!! Super cute! What a versatile pattern!